Dark Alliance Spoliers: Check out the upcoming news! This thread will be used by ourselves to give players a hint or a peek about which features are about to be implemented into Dark Alliance. The next update will feature many bug fixes related to animations. 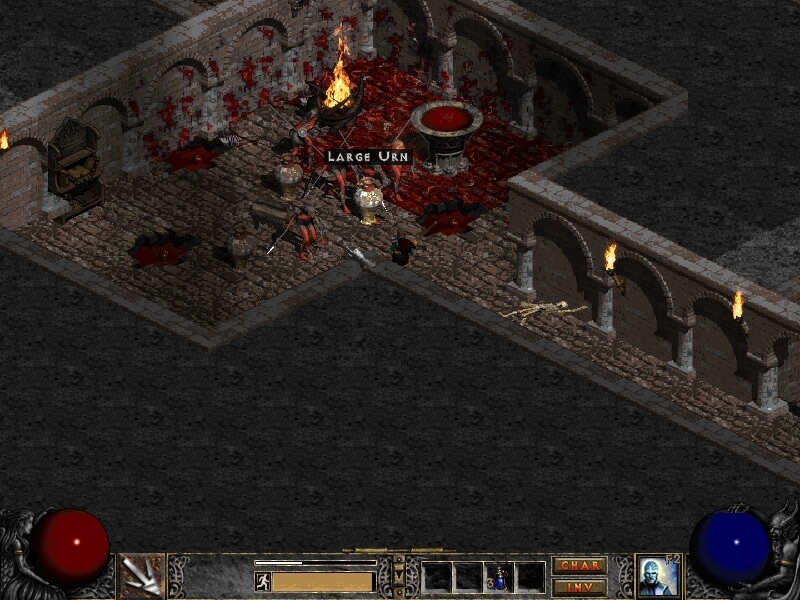 I also started on working on many animations to make them better fit Diablo II palette schemes. Another important thing, this time concerning the Sorceress, it's that her revamp has more or less started, and it has begun from pets. There have been lots of improvements to make sure (or almost sure) you won't lose pets while wandering in open areas without fighting along with giving each pet a more or less unique behavior. Least - but not least - we expect to fix many of the annoying access violation random errors! We have once again moved the planned update from march to april, and then to maj. This mainly because of a big update is coming to valley of the paradise area and that we Watch to sort as much bugs that still is there as possible. so next release feel smooth. I hope next public patch is coming this month, but cant promise anything. - This profession for npc already exist. But, its functionality will be extended to support more then one ingridense slot. A new UI will be implemented to support this. - Barbarian: Find potion skill will be renamed and tied to NPC Alchemy crafting. You will use the skill to find ingridense unique to barbarian. This will give you potions that are Barbarian themed. - npc will have own skill experience. He will level up to gain access to more recipes. Exactly how this will work will come closer patch release. - npc will display what recipes he knows (so you know what craft materials to bring to him). - This is the last tree to work on for Necromancer. This will be very unique to anything else necromancer have as it uses own resource system for the complete tree. In first round of implementation there will be 6 skills available. As we recived good feedback on what valley of paradise is missing. We decided to improve it and we hope you will like it once patch is alive. This content is coming soon. Overall improvement on valley of paradise. There is a new entrance in Valley of Paradise to enter Kaer Varenna. The dungeon is designed for level 24 characters. This will introduce complete new ai for bosses, new loot to find and more to discover. Re: Dark Alliance Spoliers: Check out the upcoming news! Hi, any Eta on upcoming patch. "Mars" - or do you mean March. You mean Last - but not least, right. I would like to provide some feedback, at least with finding bugs, I am good at finding them. Also, is there any character that lacks feedback compared to others, or you have them all covered. We working hard on get next patch released. Its getting closer, I will see how much I manage to do the 4 day vacation I have. It might be possible for a release sometime early next week. othervise its max 1-2 weeks ahead (I hope). For feedback. Necromancer/Barbarian is most complete classes (and most valued get feedback on), necro missing last tree however. The other 3 classes feedback is valued too, special as those going to be revamped in upcoming patches. For those 3 most interesting is what is fun with class and what is booring. March planned update will be moved to April so delayed a month again saddly. But, once upcoming patch is released we will focus on bring next planned contents (April content). It is always nice to learn sth new. But even if you did said least - but not least, that sounds right too, and funny a bit, or maybe it is just me. In what way you mean when you say that the pet branch is complete. Also, you talk about those minions like familiar, imp and the rest, right. I don't want to play and miss the tree. Or the pet branch is considering "done", and feedback should be around others trees? Also, what kind of feedback is needed, all (text, char stats interface displaying "wrong" stats, e.g. item gives +5, instead it is lower than that, talk windows doesn't show up) or I should focus on e.g. skills, errors that occur - like some crash I had today after reading the subquest scroll. I'm asking because some things could be the part of your development, though maybe better to report, just in case. better report just in case then it comes to bugs. Also, balance issues is very much welcome. Also, any feedback is valued as we work on improve chapter #1/#2 Before move on to next chapter. All sorceress pets have got new ai, most other non sorc pets have new ai aswell. There is a few cases where its missing still. So value on pets in general is see if it behave any odd, feel overall balanced.